Life can be unpredictable sometimes. Some days can just be stressful. Sometimes our mood is greatly effected by something or someone around us. There are also days where we may experience a traumatic event. When these unpredictable moments occur, we don’t have to be alone. 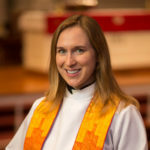 These were some of the important truths shared by Dr. Anne Wallace DiGarbo, local clinical psychologist and guest speaker to a Christian education forum at St. Peter’s on March 31, 2019. 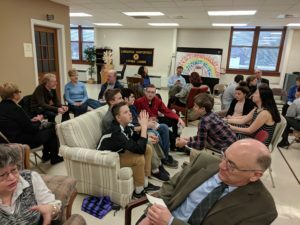 Following traumatic incidents this fall involving the youth of the greater Lancaster and Lititz community, St. Peter’s leadership sought out a community counselor to come in and facilitate discussion on the topic of ‘when trauma happens.’ High school youth and adult learners were able to be part of the conversation. During her teaching, Dr. DiGarbo shared how to respond to a friend who is showing signs of stress or speaking about self-harm or violence. She shared a list of resources for trauma, stress, and concerns about suicide. 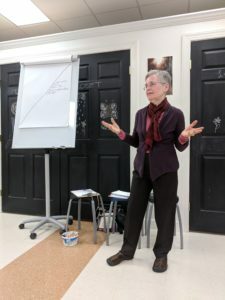 Dr. DiGarbo spoke about what happens to our bodies when we are stressed or live in an anxious state and also how our bodies positively respond to “oasis” places and healthy connections. She created small groups of conversation and sharing and was available afterward for one-on-one conversation and questions. At the end of the session Dr. DiGarbo challenged participants to adopt a new habit of health like being more mindful in deep and calming breathing, spending time in an ‘oasis’ place that created peace, or intentionally connecting to friends or a supportive group. Dr. Anne Wallace DiGarbo is a licensed clinical psychologist and a certified addictions counselor with 36 years experience as a therapist working with individuals, couples and families. She is the president of the Alternatives to Violence Project in South Central Pennsylvania (www.avpusa.org). Her husband, who is also a therapist, and she have facilitated workshops addressing trauma in Bosnia, Israel and Palestine.